Two weeks into our coding bootcamp at codinghouse we decided to attend our first hackathon. We registered to attend @developerweek as our first hackathon experience. We are beginners in this industry but we took it as a way to get more experience and network with recruiters that attend the event. I was very, very overwhelmed by the whole experience at first, but once you settle you start to see patterns and behaviors that -almost- everyone follows. Arrive early - You want to be one of the first to get to the event in order to settle and get a feel for what you are getting in to. 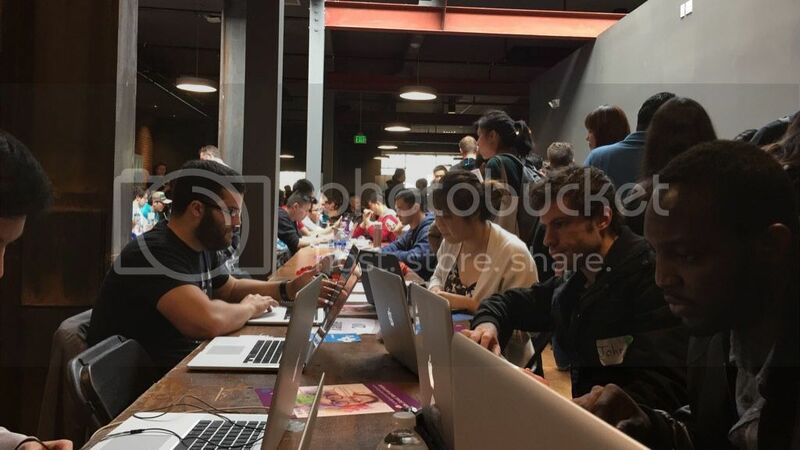 Network - Hackathons are not just for coding, it is a great place to find connections and recruiters if you are looking for a job, don't be shy and talk to people. Find a seat QUICKLY - I think this is a very important one. Instead of walking around and network or checking out the sponsor's tables, run and get a desk and set your things down. That way you reserve a seat and now you can walk around and not have to worry about getting the worst desk at the event (or working on the floor...). Prepare a day before - For @developerweek we arrived at 9:00am and settled very quickly in our desk. But I didn't plan anything for the event (or had a team at all) and by the time I decided to join a team and create something and we started coding it was already 4:30pm, we completed about 10% of the app. Lesson learned. Attend the workshops - Sponsors also have workshops where they show you how their API works or what they do. Sponsors usually give out cool prizes to the team that uses their product the best so you might want to use some sponsor API. These are just some of the observations I made during the hackathon. I will surely apply them to my next hackathon (#Launch2015) at the end of this month.